Our handmade in Kansas City has definitely taken off! It's amazing on how many handmade businesses are here that we never even heard of! Let's get to know them. We're going to start a "Meet the Maker" series. Let's meet Cody from Lu & Ed. I'm Cody, a monster making mom living in the Midwest, and owner of Lu & Ed! I moved my small family to Kansas City from the East Coast in 2009 and downsized majorly - into my mother-in-law's basement. Desperate for some storage that wouldn't take up much of our precious floor space, I dreamed up toy storage for my son that we could hang on the back of the doors for him to put his toys in, in the form of a monster he could "feed". 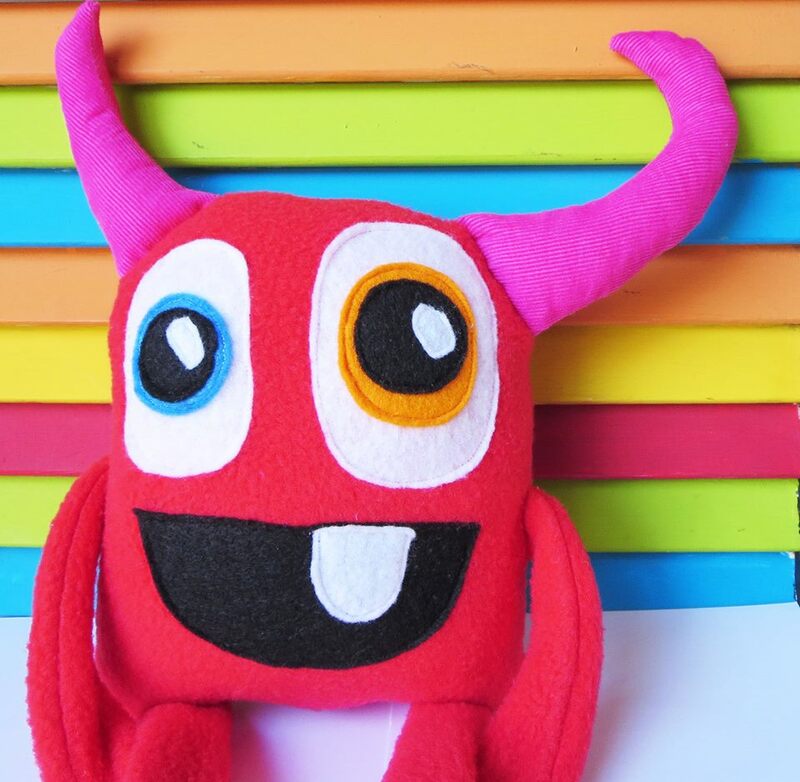 The next day, I drafted the pattern and with the help of my mother-in-law, learned to use a sewing machine, and several hours and many laughs later, the very first Mon-stor ever was born. After I posted photos of the first few Mon-stors for my son on social media, I began to get requests for them. I started making them at the cost of supplies for friends. A few weeks later I had so many requests I could barely keep up with them and I had to increase the price a bit to account for the time I was spending on them. A friend sent me a photo of their children "feeding" their Mon-stors. Knowing that something these hands created brought children so much joy and wonder filled my heart with a happiness I had never felt before. In that moment, I knew this: monster making was my calling. Another couple of weeks and I had a queue for custom orders that filled several pages in a notebook, and within three months of making the first ever Mon-stor I dropped my day job to pursue monster making full time. It was the best decision I ever made. Within six months, Mon-stors had evolved more than I ever expected them to - I started making smaller versions of the large Mon-stors that could be used for stockings, and they quickly became my most popular item because they could also be used in the car to hold diapers and wipes for babies, by the bed to hold pajamas and even in the kitchen to hold plastic bags! 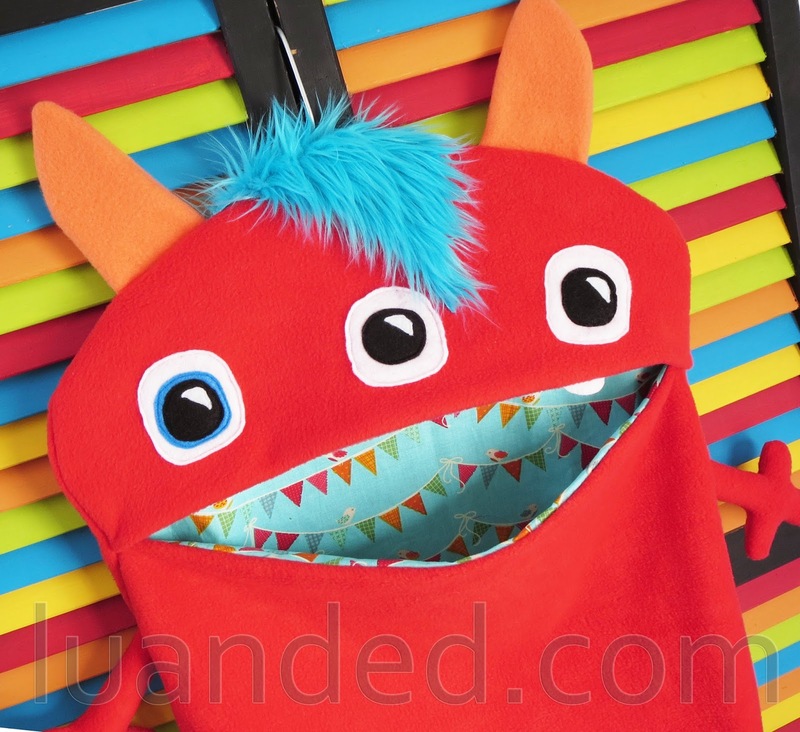 I also branched out into stuffed monsters, little monsters to hold cell phones, cameras, iPods and other gadgets, monster tooth pillows and other varieties of monster related goodness. Each new type of monster is tried, tested and approved by my son - he is definitely my inspiration and motivation for Lu & Ed. He is very involved in the process and helps me out in the studio often, matching fabrics, shopping for supplies, packaging orders, and even helping me stuff monsters. Where the monster making magic happens! As Mon-stors have evolved over the years, so have my efforts to run a green business. I think it's important to do good where you can, and I knew I could make a positive ecological impact with products and business practices. In 2011, I switched from purchasing new fabrics to purchasing post-production fabrics from thrift stores and textile discards from factories. When people learned about my eco-efforts they started donating fabric, bedding, and clothing to me to turn into Mon-stors. It takes a bit more effort, but now all Mon-stors are made from 100% upcycled and recycled fabrics. I package and ship all of my products in recycled food boxes and use biodegradable tape. Even my business cards are eco-friendly now, printed on recycled paper that is biodegradable. Saving the world - one monster at a time! As Lu & Ed has grown so has my desire to contribute to my local community of children in need. I reached out to artists I admire & collaborated with them to create a program I call Team Team Lu & Ed that proudly supports Drumm Farm with as much as 100% from Team Lu & Ed products going to the group home environment for children in the Missouri foster care system, helping make the lives of the children who reside there a little more wonderful! I am very excited to be welcomed into the Handmade in Kansas City initiative and look forward to connecting with the community through this wonderful opportunity!